Preheat your oven to 350*F. Spray 2 9 in. pans with non-stick baking spray. First, beat the 4 eggs in a large bowl until they are foamy. Once foamy, slowly add in the oil in a thin stream and beat. In a seprate bowl, mix together the dry ingredients (that would be the flour, sugar, cinnamon, baking soda, baking powder, and salt). Next, slowly add your dry mixture into your egg mixture (about 1/2 cup at a time) and beat well. Add in vanilla & milk. Fold your carrots into your batter. Also add as many chopped nuts as you please and fold them in as well. While your carrot cake is baking you can get started on the cream cheese icing. To make the cream cheese icing, first beat the cream cheese and butter until it's smooth. Next, gradually add in the confectioner's sugar. Beat until thick and fluffy. When the cakes are done, you can cut the dome shape off one of them (if it has a dome) and spread about 1/3 of the icing on top. Then, place the other cake on top and frost the entire, 2-layered cake, top and sides. I encountered many struggles with this carrot cake. The main concern was that the recipe I had did not nearly have enough liquid ingredients for the amount of dry ingredients neccessary. My mixer stopped working at times because the batter was to thick and dry, like bread dough. 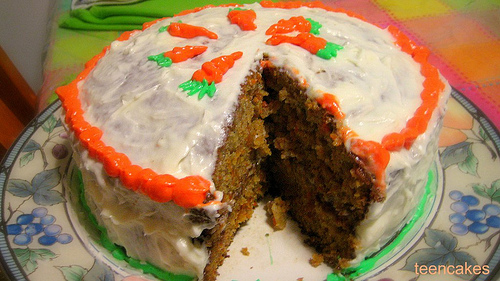 I tweaked this recipe with the exact adjustments I made to the batter while I was making this cake. The first thing I did was add a extra 1/4 cup of oil to the batter. This made a big difference is the consistency of my batter. BUT, then I remebered the milk/ butter treatment I use on cake mixes. Soo, I decided to add a splash of milk (since it was too late to add butter after I added the extra oil). The result was a super moist, cinnamon-ey carrot cake.